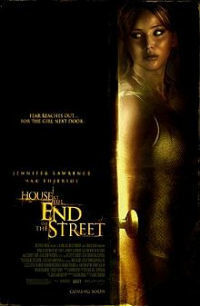 House at the End of the Street (2012) is a psychological thriller. Synopsis: A newly divorced mother, Sarah (Elisabeth Shue) and her 17-year old daughter, Elissa (Jennifer Lawrence) move to a small, rural town to reconnect and start over. They discover they are living next door to a house where a young girl, Carrie Anne murdered her parents. Elissa befriends the surviving member of the family, Ryan (Max Thieriot), only to learn there are chilling secrets that may cost her life. Max Thieriot's character, Ryan reminds me of Norman Bates from Psycho (1960). In fact, House at the End of the Street does resemble Psycho in some ways. However, it lacks the dark degree of suspense that Psycho has. I'm a bit disappointed with the so-so amount of thrill and suspense, but I do like the little twist-ending. It's kind of short but straight to the point and gives this movie a crystal-clear and bittersweet wrap. Jennifer Lawrence is still in her element but it's rather hard for me not to compare herself as Elissa to Katniss in The Hunger Games. I keep on telling myself, Elissa is just a normal 17-year old, so her character is not supposed to be able to fight a psychopath like a pro, or as tough as Katniss. LOL. I hope I haven't typecasted Jennifer Lawrence as a tough cookie. Okay, since this is the month of Halloween, it's safe to say that House at the End of the Street is the mildest horror movie of the month. Look out for these upcoming super horror movies - Sinister (watched), Paranormal Activity 4, Silent Hill: Revelation (watched).